“You say tomato, I say disaster.” If that’s you talking at the end of every summer, help is on the way. It’s so discouraging when our best efforts at growing tomatoes fail to produce great results. The good news is that a few tips can turn the harvest around. And we’ve got a few (more than a few) of those tips right here in a handy primer. 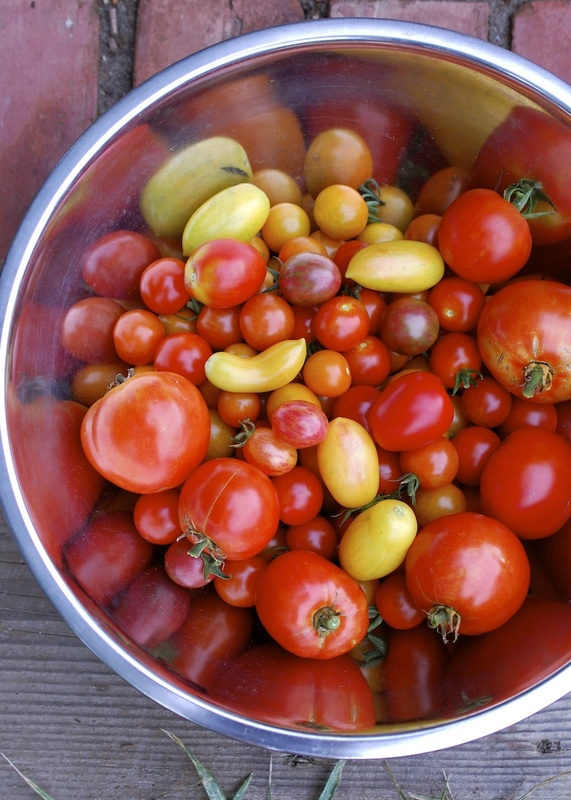 It’s kind of a “best practices” for growing tomatoes. We asked two local experts—Roxanne Kapitan, garden manager for Oakleaf Landscape in West Tisbury, and Simon Athearn, CEO of Morning Glory Farm in Edgartown—to download their best advice for planting, watering, preventing disease, and more. 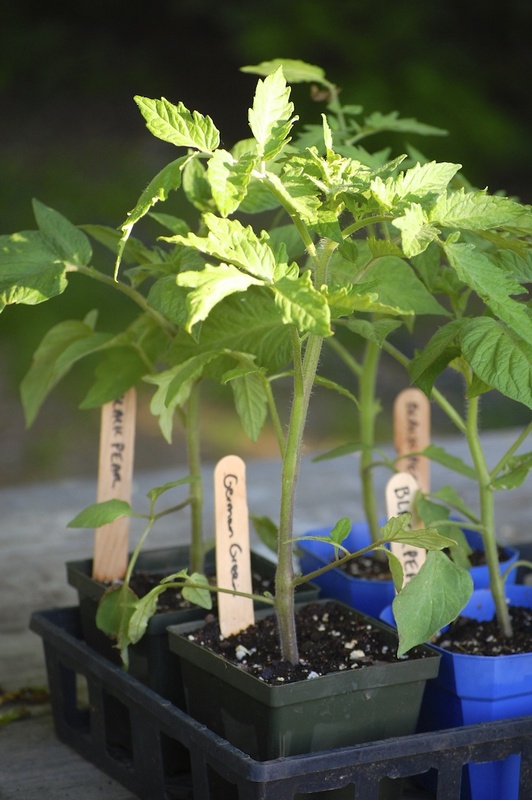 Should you start your own tomato plants from seed? That all depends. If you want to do it, “A sunny window isn’t enough,” Roxanne cautions. Unless you’re willing to invest in a grow light system (and a heating mat for germination), you will wind up with leggy and weak seedlings. These could be more susceptible to diseases or damage in the long run. On the Vineyard, it’s a common mistake to put your tomato seedlings in the ground too soon. “Planting should not happen before Memorial Day weekend,” Roxanne cautions. “If you transplant tomato seedlings before then, they are just going to sit in the cold soil and not do anything, or worse, get damaged when a late frost comes,” she adds. Up until the time of the full moon in May (May 29 this year), there’s a chance for a light frost. And if you live in a frost-bottom area (mostly on the south side of the Island) you have to be especially careful. If you do live in a cold spot and want to go ahead and get your tomato plants in, you can insulate them a bit. If you’re using tomato cages, wrap fabric row cover (also known by brand names Reemay or Agribon) around the bottom of the cage. That will raise the temperature inside by about 10 degrees and give your tomatoes an early start. buried, so planting deeply promotes a sturdy plant and one that will withstand drought better.) “Soil preparation is crucial,” Roxanne says. “I like to dig the hole, then add Coast of Maine compost and manure mix to the soil in a ratio of 5 to 1. This will greatly enhance your soil. Then add a good handful of a granulated organic fertilizer [such as Tomato Tone] and mix that in well with the soil.” Once you plant your tomatoes, build up a little ridge of soil around the plant to capture water and steer it to the roots. On the subject of fertilizer, Simon points out that tomatoes are hungry for potassium. He cautions against using fertilizer that’s too high in nitrogren, especially once plants start to flower and fruit. “A low supply of potassium will really throw off a crop,” he notes. Blossom end rot (the condition when fruits develop a dark leathery spot and eventually rot) “comes from a lack of calcium, but more often than not the lack of calcium is caused by lack of water or a lack of potassium which is needed for the plant to absorb calcium.” A fertilizer like Tomato Tone has both potassium and calcium in it. The ideal spot for planting tomatoes is full sun (8 to 10 hours a day). “But if I had to choose,” Simon says. “I’d suggest that morning sun is more important than afternoon sun. 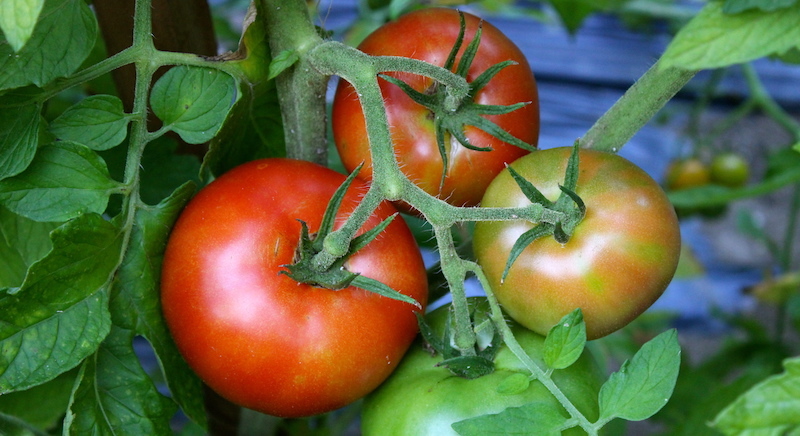 It is so important to get the dew off the leaves since tomatoes are prone to fungus. You always want to reduce leaf wetness periods. And of course, a location with great soil (or one where you’re easily able to enhance the soil, like a slightly raised bed) is ideal as well. Generally speaking, planting tomatoes two feet apart is a good rule of thumb. But determinate tomatoes (such as many plum tomatoes that fruit within a short window of time) will not need as much room as indeterminate tomatoes. Indeterminate tomatoes will basically keep growing until killed by frost or disease, and they usually outgrow their support structures, whether cages or stakes. Then they flop over and grow sideways or any which way. While spacing is not as much of an issue with modern hybrid tomatoes that have some disease resistance, “Heirlooms are very sensitive and should be given space for air circulation to stay healthy,” notes Simon. There are a few different types of tomato blight—a blight being a fungus that thrives in damp weather. While fruit can survive to ripen with some forms of blight, yields will diminish in best-case scenarios, and entire plants can die in some circumstances. While you can never entirely prevent blight from reaching your plants, you can take steps to discourage the growth of the fungi. 1. Never use overhead watering. 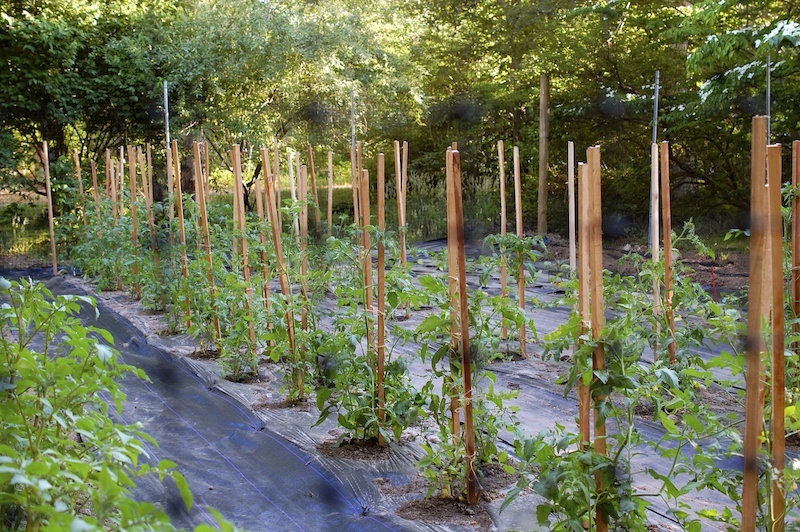 “If we have a rainy season—and you are using overhead watering—you are doomed.” Instead, arrange drip hoses or install drip irrigation at the beginning before you plant your tomatoes or while you are transplanting them. 2. Remove the bottom 6 to 12 inches of foliage from a tomato plant. “You don’t want branches touching ground where they can pick up diseases.” The subject of pruning is a big one, and Simon says at the farm they have different approaches for determinate and indeterminate tomatoes. But he concurs with Roxanne on removing lower leaves and even fruit on lower stems from all plants and he encourages keeping the canopy (the weave of tomato branches that can form over rows) open with pruning and trellising to promote good air flow. 3. Plant in full sun. (See Simon’s comments above.). Most blight happens in wet, shady conditions. Simon adds that consistent watering is key to preventing stressed tomato plants, which in turn can be more susceptible to disease. Underwatering while the plants are blooming can cause blossom drop, as well. He does mention that, at the farm, they lighten up on the watering a bit in mid harvest season to sweeten up the fruit. This is not such an unusual practice. In California, farmers sometimes use a technique called dry-farming with tomatoes. Water is restricted after initial fruiting, or the plants are started at the end of a wet season before a dry season and not irrigated additionally. While yields are smaller, the tomatoes are exceptionally flavorful. It’s easy to see this (or the opposite effect) in your own garden if you harvest tomatoes after a heavy rainfall—they will tend to taste waterlogged and sometimes their skins split. 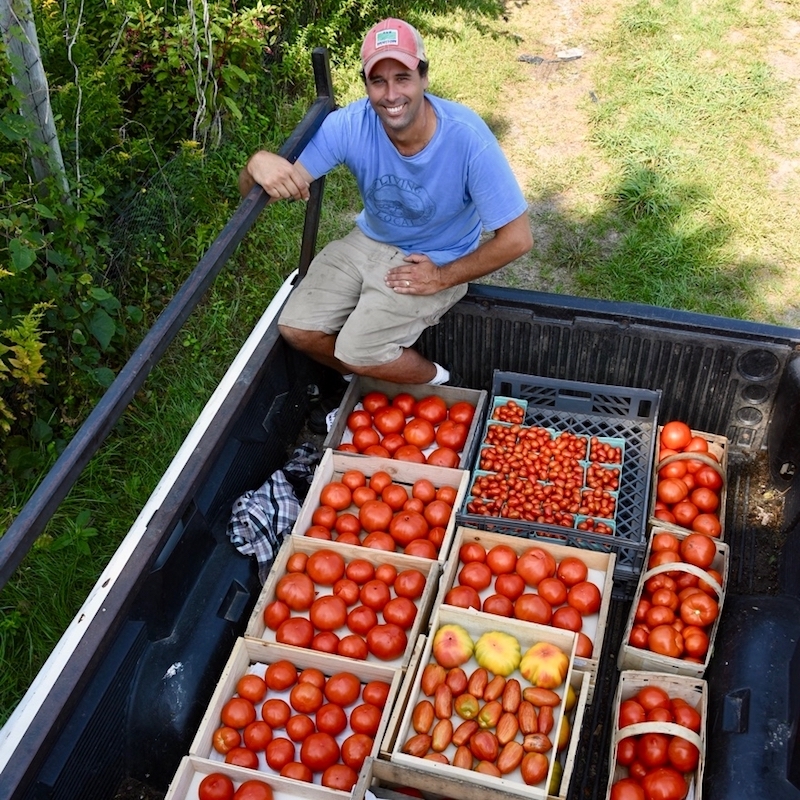 It may be the most universally loved tomato on Martha’s Vineyard. 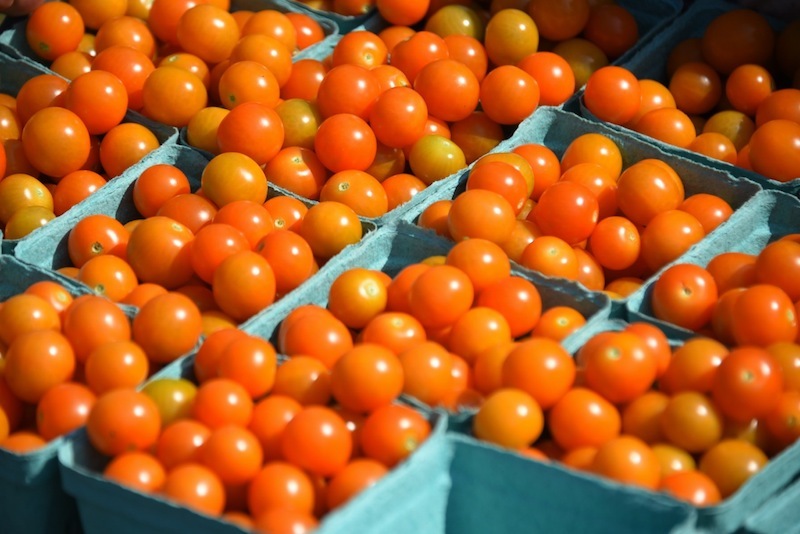 At least our two experts (and the author of this article) agree that the sweet little yellow cherry tomato known as Sungold is hard to beat. If you could only grow one kind of tomato, Sungold would be a great choice because it will give you hundreds of flavor bombs all season long to use in salads, salsas, or sauces or to eat out of hand. Roxanne’s second choice is another cherry—this one an heirloom with a very meaty texture and deep flavor. Black Cherry is late to ripen and the large fruit (for a cherry tomato) must be deeply colored before it reaches its full flavor potential. But the plants will yield heavily in early fall, and when the fruits are perfectly ripe they are wonderful in both raw and cooked dishes. After Sungold, Simon’s favorites include Speckled Roman plum tomatoes for cooking, Taxi—a small and early yellow tomato—for snacking, and the heirlooms Brandywine and yellow Brandywine for ultimate beefsteak flavor. The Brandywines always come out at or near the top in taste tests at the farm.